It is truly impossible to pick the best place for scenery in South America, so I’m forced to pick a few! Machu Picchu in Peru, considered one of the ‘Seven Wonders of the World,’ is a must see. You truly cannot get a feel for the mere size or detail of Machu Picchu until you have walked through it yourself. It’s just incredible. 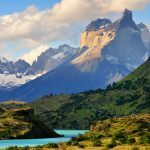 Not to state the obvious but, Torres del Paine National Park in Chile, is definitely one of the best places to visit in South America for scenery. You will be speechless, just take a look at the photos below. And one of my favorite, lesser-known scenic spots is the Cochamo Valley in Chile. In our Northern Patagonia Odyssey itinerary you’ll ride horseback on a 400-year-old trail deep into the lush Cochamo Valley forest. After crossing rivers, teetering on logs and navigating through deep ravines and massive boulders you come to an opening in the trees. A remote mountain cabin surrounded by tranquil pastures and towering granite cliffs fills your gaze. It is purely blissful. Hiking to Choquequirao in Peru, which boasts ruins like Machu Picchu but only sees a handful of visitors daily, is the ultimate South American adventure. Hike through the scenic Salktantay Mountains above the Apurimac River while marveling at the Incan footpaths and rarely-visited ruin complexes. Another one of the best hikes in South America is the famous ‘W’ route in Torres del Paine National Park in Chile. Be prepared for sensory overload as you spot untamed wildlife and trek amongst pristine lakes, colossal glaciers and jagged granite peaks. Best place for a glass of wine? A vineyard in central Chile of course! Some of our favorites are the Casa Marin Winery and Vina Matetic in the San Antonio Valley and Errazuriz, one of Chile’s oldest and most beautiful vineyards, in the Anconcagua Valley. I personally think the Reserva Amazonica Lodge deep in the Amazon Jungle in Peru is one of the best places to visit in South America, and not only for their spa. After a day of jungle hiking, boat excursions and wildlife spotting enjoy a rejuvenating massage in the small spa bungalow nestled in-between jungle trees and the Amazon river. Another amazing getaway is Tierra Atacama, situated in the vast Atacama Desert in Northern Chile. After a day of exploring relax in the pool or enjoy a hot stone massage in this one-of-a-kind, boutique adventure lodge. Lamay Organic Farm outside of Cusco in Peru combines educational lessons on planting and harvesting followed by a home-cooked meal prepared with fresh, local and organic ingredients. If you’re anything like me and that just made you hungry, here is a healthy stuffed pepper recipe based off of Peru’s rocoto relleno dish and more information on culinary travel in Peru. I am also partial to Buenos Aires, Argentina. I lived there for a short time about two years ago and practically ate my way through the city. The Guîa Natural Urbana & Orgånico Map is your ticket to every healthy restaurant, market and grocery store in Buenos Aires! Hands down the Galapagos Islands, containing about 12 main islands and 12 minor islands, wins this category. Between different excursions and on-island exploring, you won’t have time to rest your camera! 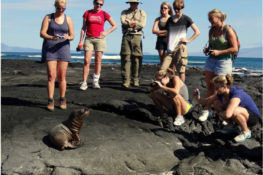 Every island has unique animal species at different times of year, making it the ideal destination for wildlife and adventurous cruising enthusiasts alike. One word; Patagonia. The scenery is unbeatable and the list of activities is endless. We have so many favorites in this category that we wrote a blog post on it a little while back, check out Jordan’s post ‘Best Patagonia Luxury Lodges’ for details on some of the world’s finest accommodations. During a day of shopping and perusing in Palermo Soho venture south to Palermo Hollywood and find yourself at one of my favorite restaurants, Artemisia. Situated in-between residential apartments and only a handful of other restaurants this place is all things lovely. With stained glass windows, rustic wood tables and incredible homemade bread I deem this one of the best lunch spots in Buenos Aires! Also in Palermo, the ‘Mercado de Las Pulgas’ will have you wishing you brought a bigger suitcase. Get lost in antiques, tastefully up-cycled home goods, historic photos and more. One of Tara’s favorite places is Palifito 1326, a small boutique hotel on Chiloé Island off the coast of Chile. With only a handful of rooms the design and detail of each space is both unique and lovely. Head up to the roof for happy hour and enjoy a glass of wine overlooking the peaceful inland sea. If you have a specific category in mind and don’t see it above, don’t be afraid to shoot us an e-mail or comment below. There is a lot more where this came from!